Air cleaning filter and ionizer! with integrated ionizer UV-LED technology and a photocatalytic filter for air purification! If indoor air is too humid, your quality of life can be negatively influenced by fungi, allergens and respiratory troubles. Medical specialists advise indoor relative humidity to be situated around 40 to 60%. The electronic dehumidifier CA-703 by Clean Air Optima does not give mildew the chance to develop. The 3-fold filtering method purifies the air of all unwanted substances, smells and microorganisms. The volume of the water tank amounts 2 litres and dehumidification performance of the device is located around 250 ml/day (at a relative humidity of 80% and 30°). These features are the reasons why the electronic air dehumidifier CA-703 with ionizer, UV light and photocatalytic filter is perfectly suited for rooms up to 20m²/50m³, like for example the bathroom or cleaning /storage rooms. The unique design of the CA-703 combines important features as effective air dehumidification with performant purification, elegant design, high functionality and sustainability. Plug & Play system: switch on and ready for action! Thermoelectric cooling with a Peltier cooler is the opposite of a thermocouple: a thermocouple transforms the temperature difference of two different metals connected to each other into electric tension. The difference in temperature creates electric tension through heat flux. The Peltier cooler transforms electric tension between two different metals into a temperature difference. 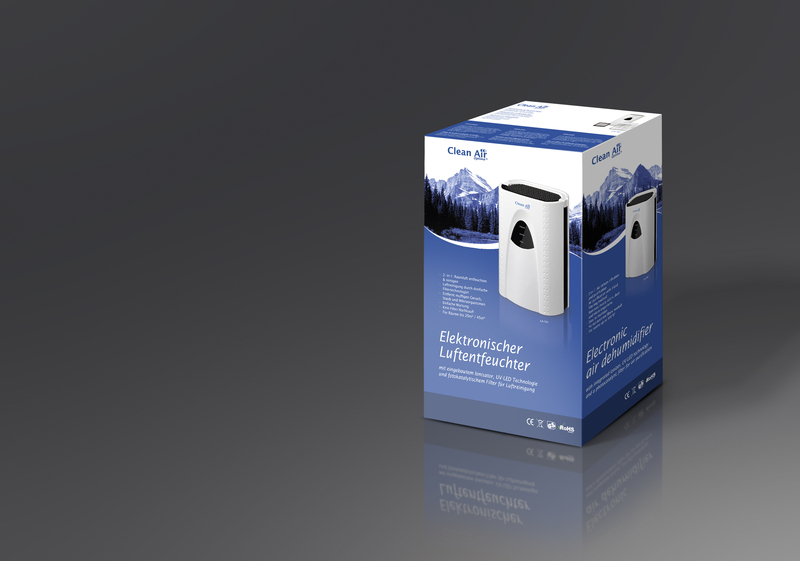 The Peltier effect inside the Clean Air Optima dehumidifier CA-703 is used to conduct warmth from a cold to a warm place. A chain of Peltier units can be utilized as cooling (or heating) element and leads to a condensation of air. That is how a heat pump without loose parts or fluids is created. The dehumidifier by Clean Air Optima CA-703 with ionizer can hence easily be maintained and does not vibrate because there is no built in compressor! 1. Aspiration of humid and dirty indoor air with the silent yet strong fan equipped with ball-bearing. 2. Humid air is channeled along the Peltier cooler. Humidity condensates and is collected in a water tank with a capacity of 2 liters. 3. Performance of the ionizer >3.000.000 negative ions/cm³ purify and refresh indoor air. 4. UV (ultraviolet) light eliminates bacteria, mildew, fungi and viruses. 5. Photocatalytic filter / UV-LED eliminate unpleasant smells, viruses and bacteria. 6. Antibacterial material was integrated into the chassis. Clean and healthy air can now flow through the room. 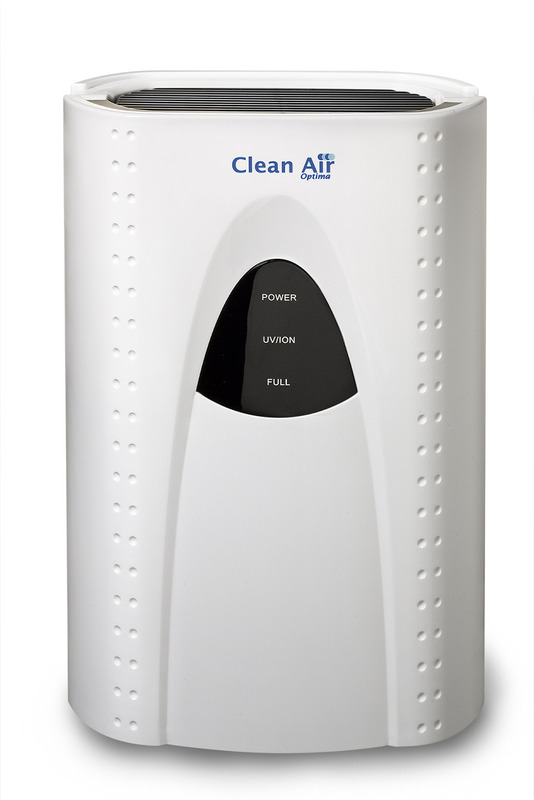 The air dehumidifier CA-703 by Clean Air Optima is equipped with an integrated ionizer for the production of negative ions which are purifying and refreshing indoor air. The positive feature of the ionizer is the enrichment of air with active oxygen. Negative ions stick to dust particles, microorganisms and other unwanted particles in the air and connect them to each other. The particles get heavier than the air and fall to the ground or are filtered by the purifier. UVC eliminates bacteria, mildew, fungi and viruses. This combination provides a very strong bactericidal and virucidal effect. The photocatalytic filter is made out of titanium dioxide. If this material is exposed to UV light hydrogen peroxide (H²O²) and hydroxyl radicals (OH) are freed. These substances can eliminate unpleasant smells and destroy bacteria and viruses. The all-round electronic air dehumidifier CA-703 by Clean Air Optima with strong air purification through the integrated ionizer, UV light and photocatalytic filter is compact, silent and very effective. It is operational with a temperature of 15 °C and above a relative humidity of 40%. The device is equipped with an automatic programme and can hence also be used in rooms without supervision. Its elegant design and the discreet colours make it fit into every interior. It is ideal for operation in small rooms, the office, the lavatory, the drying room, an exercise room, the bathroom, a depot etc. 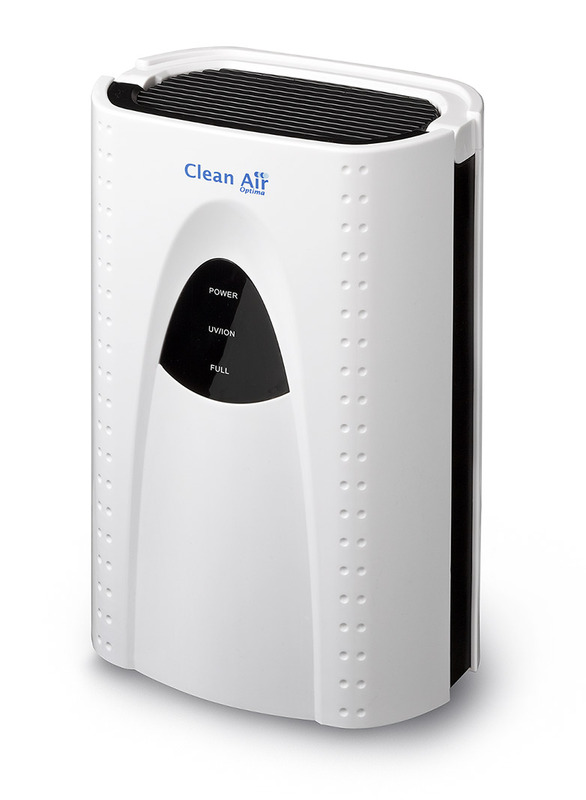 The electronic dehumidifier CA-703 by Clean Air Optima reduces relative humidity in indoor rooms. Dust mites, other vermin and fungi develop at their best in a humid environment. The most important causes for allergic problems are dust mites and mildew. 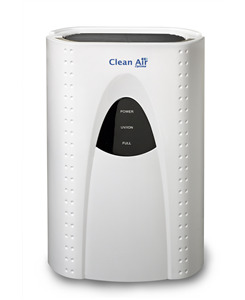 Strong air purification with the three fold filter technology of the unique CA-703 had direct effect on the prevention and reduction of allergies. The optimal working temperature for the electronic air dehumidifier CA-703 by Clean Air Optima with Peltier cooler which creates condensation through cooling, lies at +15 to +25°C. It is deal for smaller rooms, the bathroom, recreational rooms, small offices, working and storage rooms. Thanks to its automatic programme, it is operational without any supervision. Its elegant design and discreet colours make it fit into every interior. There are four kinds of air dehumidifiers: with compressor, with desiccant, condensation dryers (with Peltier cooler as in the dehumidifier type CA-703) and silica gel / adsorptive dehumidifiers (see type CA-704 by Clean Air Optima). The most effective dehumidification and most optimal drying procedure can be determined for two drying methods: adsorptive drying and condensation drying. For high temperatures and high humidity in small rooms, we advise the condensation dryer CA-703. Adsorptive dryers are mostly used when a very low humidity under 35% must be reached or if a very low dew-point is necessary or given because of climate conditions. The ideal operation temperature of a condensation dryer is located at +15 to +25°C. Adsorptive dryers on the other hand deliver good results even when the temperature is situated beneath +15°. The highly efficient electronic air dehumidifier CA-703 by Clean Air Optima is perfectly equipped for powerful air purification thanks to its integrated ionizer, UV LED light and a photocatalytic filter. 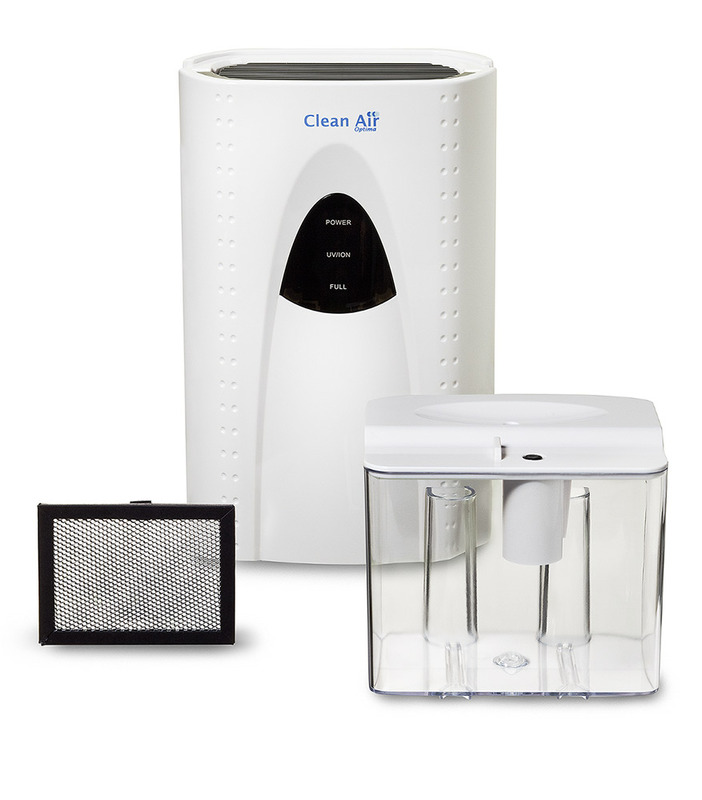 This 3 fold filtering method purifies the air of all unwanted particles, substances, smells and microorganisms. Iron and steel do not rust if relative humidity is located beneath 50%. There will be no condensation on surfaces if the air that gets into contact with these surfaces has a dew-point located beneath the temperature of the surface. Mildew needs humidity for its development. If relative humidity is reduced by air drying, the most important cause for the development of mildew is eliminated. Bacteria also need humidity for their development. The humidity needed for the development of bacteria is often located on hygroscopic material. If one keeps relative humidity indoors beneath 50% no fertile environment for the development of bacteria can be created. Unpleasant smells are drastically reduced if relative humidity is lower than 50%. In general odour-forming substances stay connected to vapor in the air. The less water molecules are present in indoor air, the less “odour-molecules” can reach our respiratory ducts. Technology: Dehumidification with Peltier cooler Air purification with ionizer, UV LED and photocatalytic filter. Automatic programme for dehumidification and purification of indoor air. First switch of the device and then pull the plug. The integrated permanent UV LED lamp comes with 20.000 lighting hours. The permanent photocatalytic filter is located in the upper part of the device, under the handle and can be pushed out of the device sideways. The photocatalytic filter needs to be cleaned once a week by brushing it carefully. If the device is used 24/7 and under normal circumstance, then we advise to clean the accumulated dust once a week from the air inlet and the air outlet, as well as inside the device. Clean the exterior side of the device with a humid cloth. If the dehumidifier is not used for a longer period of time, we advise to clean the device as well as all parts thoroughly. Let it dry well. Store the device at a cool and dry place. Ho acquistato due deumidificatori per due stanze di cui : una di 14 metri quadrati (31 metri cubi) e una di 12 metri quadrati (37 metri cubi) . Il prodotto è progettato per ambienti fino a 20 metri quadrati e quindi adatto per la stanze per cui li ho acquistati. La foto del prodotto sul sito non rende bene l'idea della grandezza; infatti il deumificatore sembra molto più grande in foto; in realta è molto picccolo ,compatto e occupa veramente poco spazio. Interessante sono la luce uv-led e lo ionizzatore integrato; che garantiscono una migliore qualità dell'aria. La capacità di estrarre umidità di questo prodotto è molto variabile e dipende da vari fattori tra cui : la percentuale di umidità e la grandezza della stanza in cui viene posizionato. Li ho provati accesi per 12-15 ore al giorno e ho notato subito un cambiamento positivo della umidità nelle stanze; l'aria risulta più secca e più pulita. La quantità di acqua estratta è variabile e nel mio caso sono di pochi ml al giorno. Lavora molto bene ma in tempi lunghi; quindi deve rimanere parecchie ore accesso per eliminare l'umidità in eccesso. Per quanto riguarda la rumorosità di questo deumidificatore avrei preferito che fosse meno rumoroso perchè non è adatto per dormirci. Nel complesso il mio giudizio è positivo ma da migliorare la rumorosità. De rare luchtjes in mijn barruimte onder de huiskamer zijn weg, dus hierdoor ook geen kans meer op schimmelvorming. Goed voor de gezondheid dus. Compact apparaat, maakt niet teveel geluid en doet wat het moet doen. Mis alleen een luchtvochtigheidssensor.